Update: Bosco is back thriving after a couple bouts of pneumonia and multiple trips to Vancouver's Canada West Hospital to see the Critical Care Team, Internal Medicine specialist and a Neurologist from back East that comes to BC that specializes in epilepsy. To get the bottom of what was causing Bosco's pneumonia we have learnt that Bosco has Chronic Bronchitis and will for the rest of his life yet with a little medication & major persistence we have found what will work for him long term. Bosco is still on 2 medications to control his seizures & we have been working closely with the Neurologist to help keep Bosco seizure free. Due to multiple urgent vet bills, x-rays, lab work and medication cost for he's currently cost over $18,000 in medical. 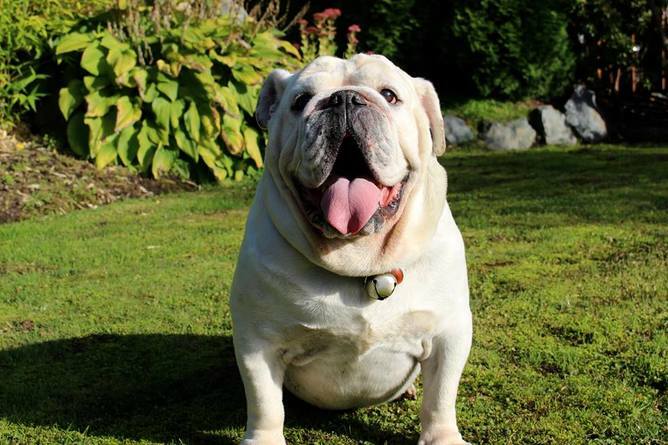 We understand this is a lot for the average dog owner but due to the specific bulldog breeds medical & treatable conditions we continue to treat Bosco as a family member & he's worth every penny! Thank you for support & donations to help with his medical. It hasn't been easy taking on an extreme medical case. I know in other rescues/shelters he might not still be here in the community spreading his love and joy with everyone he meets! Update: Bosco recently had Pneumonia on July 1st. We are currently taking applications for Bosco but until he's all recovered we can't adopt him out. Foster to adopt would be an option for his amazing for home. Bosco's vet Bill was $6323.15. If you are to help with medical costs contact melaniedmdsouza@hotmail.com we have a PayPal's account set-up to help for his ongoing medical costs. ​Bosco is so handsome & wrinkly! He's just turned 5 years old on Nov 30th so he's just a young guy still. Bosco has epilepsy and is on 2 medications to control his seizures. He drinks a lot of water and is a bit clumsy due to medications side effects. Bosco was neutered and he had a full dental cleaning with 2 teeth extracted. He's now all healed up and ready to search for his forever home! Bosco also has interdigit cysts, which he gets mostly on his front feet very common in Bulldogs. Yet since a change of food he has only had one in this year. Bosco would love a home with people home as much as possible. He is now house trained but requires very frequent access to the outside or he will have an accident, such as a doggie door he will happily let himself out. So he can't last an 8 or even a 3 hour day without being let out multiple times. Bosco loves his strolling walks and checking everything out at the park. He is great with other dogs but gets a bit scared when dogs bark at him. Bosco loves helping with shredding the recycling and is maybe a bit too helpful as he likes to eat the recycling so he's off the duty for helping with recycling. Bosco has not lived with cats and is currently living in a multi-dog household and doing amazing. Please contact Melanie Dry at melaniedmdsouza@hotmail.com if you would like more information about Bosco. You can click the above Email for an adoption application button to apply to adopt Bosco. Thanks for stopping by and checking out Bosco! We are currently trying to raise some money to help with medical costs for Bosco medical bills. We are fortunate to be able to take in bulldogs as owner surrenders but with that comes medical expenses and, as you probably know, Bulldogs aren't cheap. All money donated goes directly to the medical expenses for Bosco.